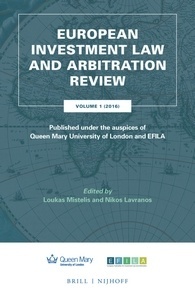 The European Investment Law and Arbitration Review is the first journal that is specifcally focusing on European investment law and arbitration. The Review is co-published by EFILA and Queen Mary University of London. The Editors-in-Chief are Prof. Loukas Mistelis (QMU) and Prof. Nikos Lavranos (SG of EFILA). The third issue of the Review has been published in December 2018 by Brill – Martinus Nijhoff Publishers. The 2019 Call for Papers 2019 and the Essay Competition 2019 are open now. Click here for the table of contents of the 2018 (3) issue. Click here for the table of contents of the 2017 (2) issue. Click here for the table of contents of the 2016 (1) issue.